Comfortable jersey overall made from softly falling cotton/modal/elastane mix, imprinted over and over with exquisite design creations exuding the Blutsgeschwister blues. 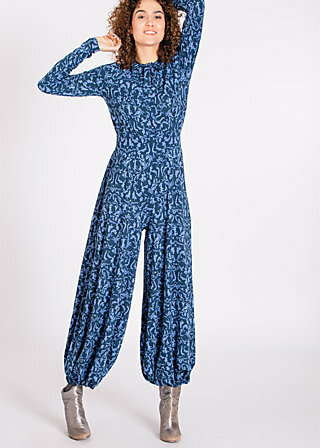 The elegant jumpsuit with wide flared leg, long raglan sleeves and comfortable waistband is turned into a sarouel via drawstring. This supple piece is a truly royal sensation!